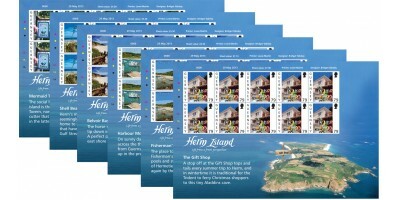 Stamp Descriptions 40p - Mermaid Tavern53p - Shell Beach55p - Belvoir Bay63p - Herm Harbour Moorings71p - Fishermans Beach79p - Herm Gift Shop Our sets are supplied in a robust glassine bag. You may.. The Philatelic Bureau offers a first day cover service in respect of all stamp issues. A set of stamps is affixed to an unaddressed, specially designed envelope and it is cancelled with a special pi..
After what seems like a lifetime of rain and cold, we are seeing the first stirrings of spring in the island and when the sun comes out in Guernsey, so do we. It won’t take many more blue skies for us to be scooting across the Little Russell on pleasure boats and ferries to fall back under the spell of our beloved Herm. 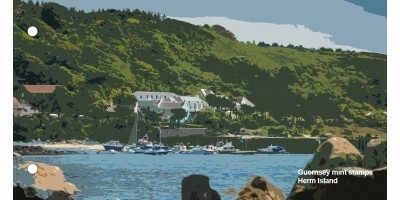 We have been enchanted with our sister isle since it was bought by the States of Guernsey after the war for us to enjoy, and we return year after year to walk its spectacular cliff paths, seal watch, sleep under canvas, sit on the glorious sands of Shell Beach or enjoy a drink at the legendary Mermaid Tavern. 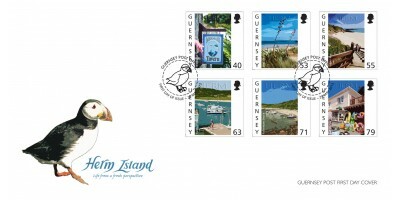 Our latest stamps depict some of our favourite spots and remind us why we love the island so much. 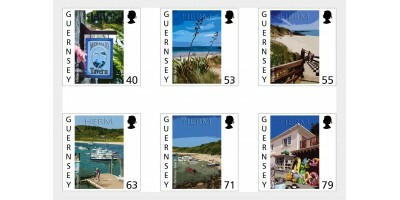 But it is not just Bailiwick residents who flock to Herm’s shores - visitors come from all over the world to step back in time and enjoy a brief respite from the rigours of life in the twenty-first century.